The OSG keeps a registry containing active projects, virtual organizations (VOs), resources, and resource downtimes stored as as YAML files in the topology GitHub repository. This registry is used for accounting data, contact information, and resource availability, particularly if your site is part of the World LHC Computing Grid (WLCG). Use this page to learn how to register information in the OSG. If you find your name and see an associated GitHub account, you can start submitting registrations! If you find your name but do not see an associated GitHub account, send an email to help@opensciencegrid.org with your GitHub ID. Description of your OSG affiliation, e.g. FermiGrid site administrator, senior scientist for the DUNE experiment, etc. The OSG treats any email addresses and phone numbers as confidential data but does not make any guarantees of privacy. An OSG resource is a host that provides grid services, e.g. Compute Elements, storage endpoints, or perfSonar hosts. See the full list of services that should be registered in the OSG topology here. Site Smaller than a facility; typically represents an academic department, research group, or a computing center, e.g. CHTC for the Center for High Throughput Computing. Resource A host that provides grid services, e.g. Compute Elements, storage endpoints, or perfSonar hosts. A resource may provide more than one service. OSG resources are stored in the GitHub repository as YAML files under a directory structure that reflects the above hierarchy, i.e. topology/<FACILITY>/<SITE>/<RESOURCE GROUP>.yaml from the root of the topology repository. 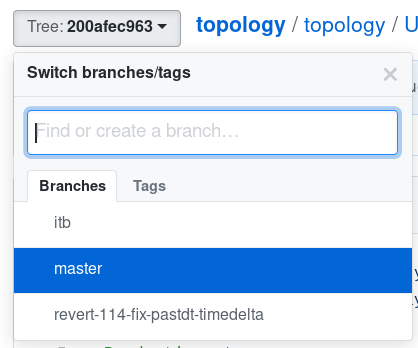 Open the topology repository in your browser. If the search doesn't return any results, skip to these instructions for registering a new resource. If the search returns a single YAML file, open the link to the YAML file and skip to these instructions for modifying an existing resources. If the search returns more than one YAML file, please contact us. "You're editing a file in a project you don't have write access to." If you see this message in the GitHub file editor, this is normal and it is because you do not have direct write access to the OSG copy of the topology data, which is why you are creating a pull request. Make changes with the GitHub file editor using the resource group template as a guide. You may leave any ID or GroupID fields blank. When adding new entries, make sure that the formatting and indentation of your entry matches that of the template. Find the resource that you would like to modify by searching GitHub, and open the link to the YAML file. Click the branch selector button next to the file path and select the master branch. Make changes with the GitHub file editor using the resource group template as a guide. You may leave any ID or GroupID fields blank. Make sure that the formatting and indentation of the modified entry does not change. You may have to add the Active attribute it if does not already exist within the resource definition. If the resource does not contain a CE (Compute Element) or OSG submitter service, you may remove the resource completely. If there are no more resources in the resource group, you may remove the entire resource group file. Resource downtime is a finite period of time for which one or more of the grid services of a registered resource are unavailable. If your registered resource is expected to be in downtime for an undetermined amount of time, set Active: False in the resource instead. Downtimes are stored in YAML files alongside the resource group YAML files as described here. Do not put downtime updates in the same pull request as other topology updates. Open the downtime generation webform in your browser. Select your facility from the corresponding list. Select the resource that will be down from the corresponding list. Select all the services that will be down. To select multiple, use Control-Click on Windows and Linux, or Command-Click on macOS. Fill the other fields with information about the downtime. If the information is valid, a block of text will be displayed in the box labeled Generated YAML. Otherwise, check for error messages and fix your input. Follow the instructions shown below the generated block of text. Wait for OSG staff to approve and merge your new downtime. In case an already registered downtime is incorrect or need to be updated to reflect new information, you can modify existing downtime entries using the GitHub editor. Changes to the ID or CreatedTime fields will be rejected. If the search returns a single YAML file, note the name of the facility, site, and resource group and continue to the next step. If the search doesn't return any results or returns more than one YAML file, please contact us. Make changes with the GitHub file editor using the downtime template as a reference. Make sure that the formatting and indentation of the modified entry does not change. Wait for OSG staff to approve and merge your modified downtime. Virtual Organizations (VOs) are sets of groups or individuals defined by some common cyber-infrastructure need. This can be a scientific experiment, a university campus or a distributed research effort. A VO represents all its members and their common needs in a grid environment. A VO also includes the group’s computing/storage resources and services. For more information about VOs, see this page. Before submitting a registration for a new VO, please contact us describing your organization's computing needs. In the new file dialog, enter <VO>.yaml, replacing <VO> with the name of your VO. Make changes with the GitHub file editor using the VO template as a guide. You may leave any ID fields blank. If you are modifying existing entries, make sure you do not change formatting or indentation of the modified entry. Before submitting a registration for a new project, please contact us describing your organization's computing needs. In the new file dialog, enter <PROJECT>.yaml, replacing <PROJECT> with the name of your project. Make changes with the GitHub file editor using the project template as a guide. You may leave any ID fields blank. If you are modifying existing entries, make sure you do not change formatting or indentation of the modified entry. To get assistance, please use the this page.